Party General Secretary Nguyen Phu Trong has expressed his belief that with new momentum and under the sound leadership of the Party and the effective management of the State, the Party, people and army will overcome all challenges to build a prosperous country. 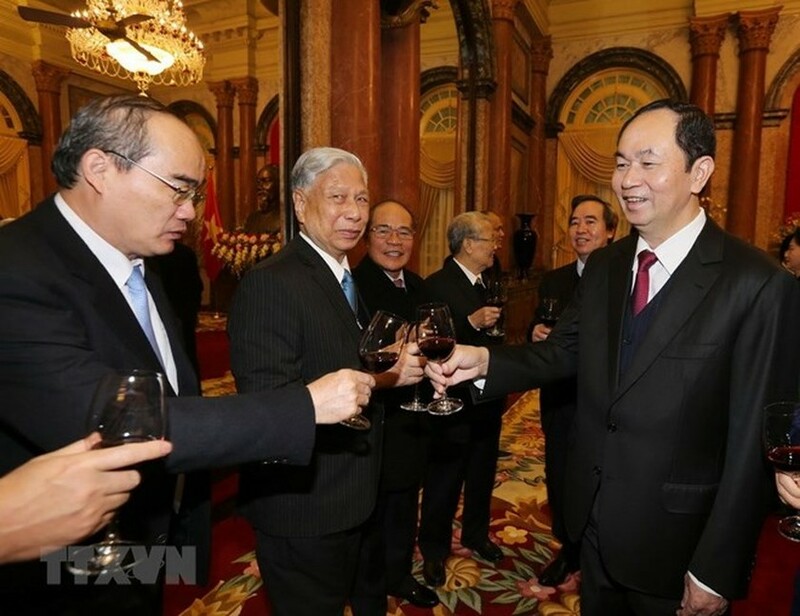 The Party leader made the statement at a meeting held on the occasion of the traditional Tet holiday at the Presidential Palace, Hanoi, on February 13. The meeting saw the presence of incumbent and former Party, State and National Assembly leaders, including former Party General Secretaries Le Kha Phieu and Nong Duc Manh, President Tran Dai Quang, former President Tran Duc Luong, Prime Minister Nguyen Xuan Phuc, National Assembly (NA) Chairwoman Nguyen Thi Kim Ngan, former NA Chairman Nguyen Sinh Hung and President of the Vietnam Fatherland Front Central Committee Tran Thanh Man, among others. 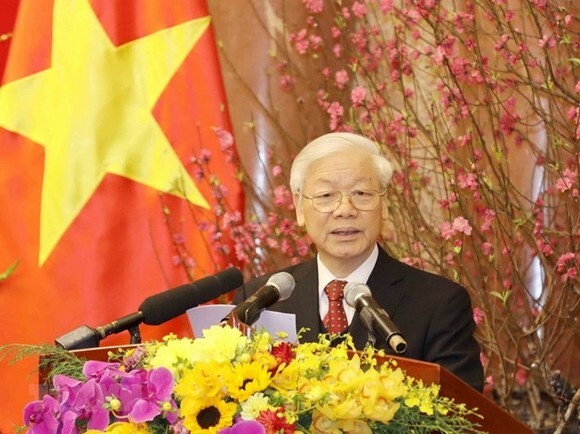 In his remarks, Party General Secretary Trong reviewed achievements Vietnam has recorded over the past year across fields, will all the 13 set targets fulfilled or overfulfilled for the first time. He highlighted the country’s GDP growth rate at 6.81 percent, macro-economic stability, curbed inflation and low budget overspending, adding that the total export-import revenue hit the record high of US$425 billion . Besides, production and business activities of the industrial, agricultural and service sectors have recovered and developed, while progresses were seen in tourism, culture, social affairs and crime combat, contributing to consolidating political security and ensuring social order and safety, the Party chief said. He also stressed that 2017 is the most successful year in external affairs, citing as examples a range of events such as the Vietnam-Laos Solidarity and Friendship Year, the Vietnam-Cambodia Friendship Year and APEC Year 2017. “We have resolutely and persistently protected national independence, sovereignty and territorial integrity, and ensured political security, social order and safety, and the country’s strategic interests, while maintaining a peaceful, stable and cooperative environment, maintaining good ties with neighbouring countries and creating a favourable environment for national construction and defence,” he said. Such achievements have contributed to consolidating public trust, promoting patriotism and national pride, and bringing the country forwards on the path of Doi Moi, he said, attributing the results to the Party guidelines that meet the people’s aspiration, as well as national solidarity and joint efforts and consensus made by the entire Party, people and army. 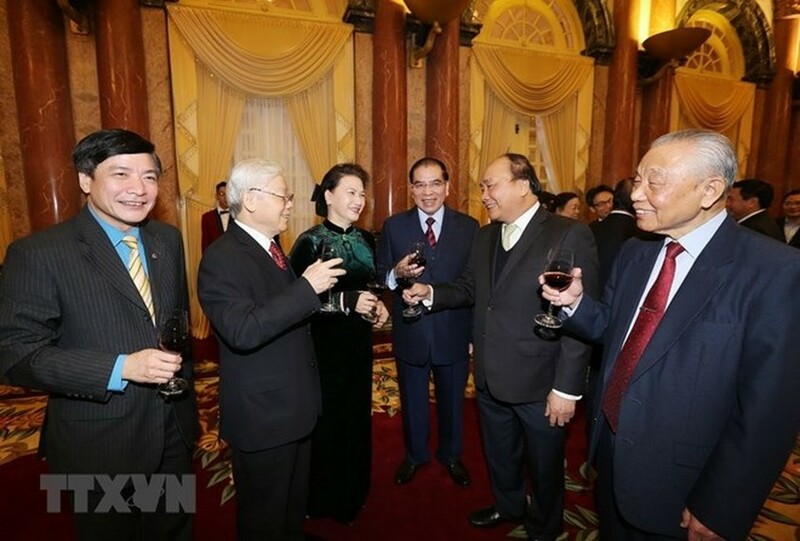 The Party leader honoured the contributions of veteran revolutionaries, Heroic Vietnamese Mothers, officials, Party members, the people, soldiers, and Vietnamese expat. He also expressed thank for the support and cooperation of foreign countries, international organisations and friends. The Party leader stressed that 2018 is a decisive year in implementing the five-year development plan from 2016-2020. He called on the entire Party, people and army to make greater efforts to carry out the tasks set in the Resolution of the 12th National Party Congress, reminding that apart from opportunities and favourable conditions, Vietnam is facing multiple new challenges. Accordingly, priority should be given to completing the socialist-oriented market economic institutions, creating more remarkable changes in economic restructuring in combination with growth model reform, and improving productivity and economic competitiveness, the Party chief said. At the same time, it is necessary to push forward the fundamental and comprehensive reform of the education-training sector, human resources development and scientific-technological applications in order to make the best use of opportunities generated by the fourth industrial revolution, he said. The leader listed other tasks like strengthening people-based national defence and public security, intensifying external relations in national defence and security, safeguarding national security, social order and safety, and fighting plots and sabotaging activities of hostile forces. He called for more efforts in building a pure, strong, effective Party and political system, as well as the resolve to combat corruption, wastefulness and other bad deeds, in order to consolidate public trust in the Party and State. 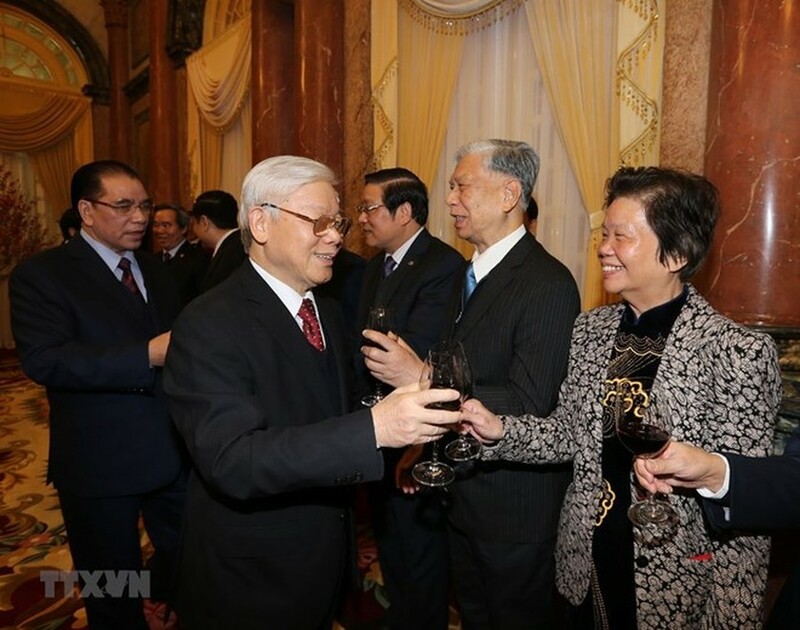 Hosts and guests raised toasts to the success of the nation’s revolutionary cause, the growth of the Party, prosperity of the country and happiness of the people.